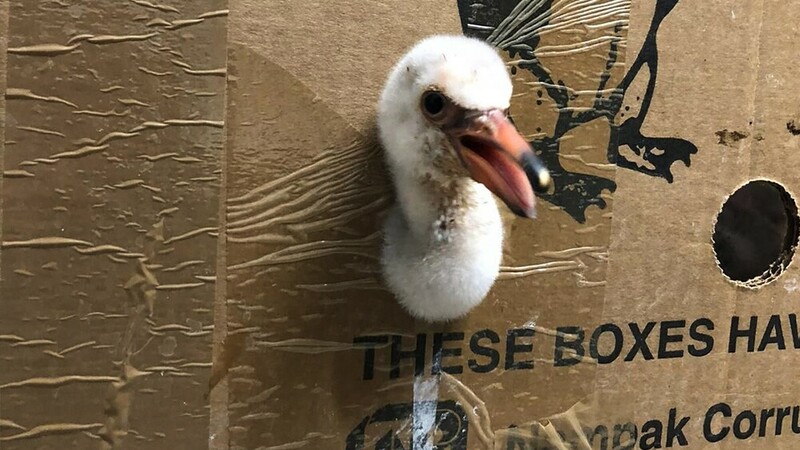 BALTIMORE — Representatives for the Maryland Zoo went out of the country last week to help save flamingo chicks that were abandoned during a drought. The zoo announced on Thursday they sent Jess Phillips, Area Manger for Penguin Coast, to Cape Town, South Africa, to help support the rescue and rehabilitation of 285 lesser flamingo chicks who were abandoned at their nesting grounds during a January drought. Phillips was sent to the Southern African Foundation for the Conservation where the zoo has helped with African penguin rehabilitation over the years. The zoo said the rescue happened at Kamfers Dam in Kimberley, about 600 miles from the South African coast, after the 1200-acre lake began to dry up, causing thousands of flamingos to abandon their eggs. In Africa, Phillips is feeding, cleaning, monitoring, and checking out 75-100 birds during his shifts. Phillips says the chicks need to be fed every three hours, but there is still time for them to go outside for sun and a swim or paddle. Lesser flamingos one of six species of the bird, and are listed as near threatened by the International Union for the Conservation of Species. They usual live in super-alkaline lakes in southern and eastern Africa, and in southwestern Asia. For updates on the flamingo chicks, go to www.marylandzoo.org .